REALTIME’S COVERAGE OF LAST YEAR’S MELBOURNE INTERNATIONAL ARTS FESTIVAL FEATURED AN EXCITING RANGE OF NEW DANCE WORK FROM LOCAL ARTISTS. FOR THE DEPLETED SECTOR IN SYDNEY, MASS MIGRATION WAS SERIOUSLY CONTEMPLATED. 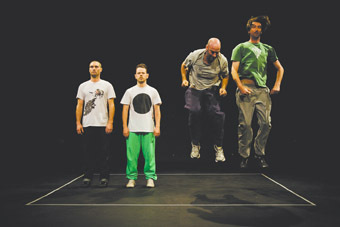 IN MARCH, IN A WELCOME JOINT INITIATIVE, THE THREE HOUSES OF MELBOURNE’S CONTEMPORARY PERFORMANCE CULTURE—ARTS HOUSE, DANCEHOUSE AND MALTHOUSE ARE THROWING OPEN THEIR DOORS TO CO-HOST TWO WEEKS OF CONTEMPORARY DANCE PROGRAMMING IN THE FORM OF DANCE MASSIVE. THE GENEROSITY IMPLIED IN THE EVENT’S TITLE IS REFLECTED IN A PROGRAM OF 15 WORKS FROM WITHIN AND OUTSIDE THE HOME STATE. Oppositional themes abound: circadian rhythms underscored by driving beats; population growth and the auditory phenomenon of feedback” (Rogue’s A Volume Problem and The Counting); Australians homesick in Berlin (Splintergroup’s Lawn); a couple stranded in the middle of nowhere (Splintergroup’s Roadkill); the monster within (Jo Lloyd’s Melbourne Spawned a Monster); two performers/two viewers (Inert); the substitution of real life for imitation (Luke George’s Lifesize). Shelley Lasica’s Vianne tests the fissures; in Limina, Michaela Pegum dances at the point where one thing becomes another and is for a time both; Helen Herbertson’s Morphia Series takes us directly to dreamstate (do not pass go); The Fondue’s No Success Like Failure playfully lays bare the schizophrenic state of the dancing life and Chunky’s Mortal Engine dares to come between the performer and her light source. Steven Richardson, Artistic Director at Arts House, sees Dance Massive as “creating some essential critical dialogue around contemporary dance, setting a national context to present work in a concentrated cluster of programming” and also as offering the chance to host some international guests, “either presenters or potential co-producers, to really enter into that dialogue (and possible co-production) with Australian artists, many of whom are at the leading edge of contemporary dance internationally.” Currently in Australia, according to the Dance Massive program, there are around 50 dance companies and more than 200 choreographers investigating a range of techniques, culturally diverse forms, contexts and media. “Australian contemporary dance is in demand internationally. It has a strong track record for touring work,” says Richardson.